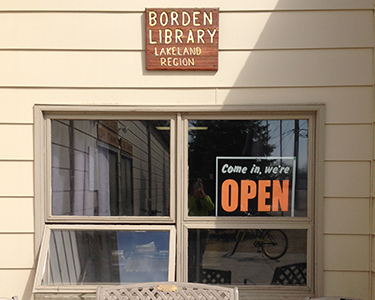 The Borden Library is a branch of the Lakeland Library with headquarters in North Battleford. Friday: 1:30 p.m. - 4:30 p.m. The librarian is Melissa Braun and assistant librarians are Gayle Wensley and Eleanor Walton. The Library provides a variety of services. We have two public computers, printer and photocopier. We also have an extensive resource of reading material for all ages; dvd's, talking books, e-resources, etc. With a library card you are able to download books for no cost as well as access to free magazines, newspapers from around the world and a long list of extensive online resources. We strongly encourage everyone in the community to come in a get a library card at no cost. The library offers a summer reading program for children ages 5-12 years once a week. The LEGO LIBRARY CLUB is held twice a year in fall and spring. Children can make a creative Lego structure according to the "theme of the week" and it will be on display for the next week. Children 5 years and up are welcome to come build and play. This is a free club. The SUMMER ACTIVITY PROGRAM runs every summer for 6 weeks. This is a great reading/activity program for children from 5 - 12 years old.